As I twittered earlier today, I finally bit the bullet and sent Yahoo $25 to upgrade my flickr account to the Pro version. For anyone wondering why my photos section has been sitting at 200 photos for a month or two now, that’s why! You see though flickr is great, their free accounts are limited to only 200 photos. The photos section on this site pulls my pictures off my flickr photostream, so since I reached my 200 photo max on flickr, my photo section on this blog hasn’t been updated. Now that I’ve upgraded to the pro flickr account, my photos section here will be updated much more frequently and has an additional 60 photos in it right now. To celebrate the occasion, let’s take a look at the last 3 pictures I uploaded to flickr. They’re all odd, funny, or cool signs from the Boston area. Saw this sign in Dorchester on a little side street on my way to the local Stop & Shop. That’s a really cool sign and seeing it so far north made it stick out brilliantly amongst the other tattered signs on the street. Seriously, you cannot make this stuff up! Saw this advertisement on the side of a bus stop on Commonwealth Avenue near Boston University. As my loyal readers already know I bought a bicycle a few months back and have been in love with cycling ever since. As many other Dorchester youths did when they were kids, I biked all over my neighborhood growing up so this advertisement hit a personal note, as I’m sure it does with many people who see it. 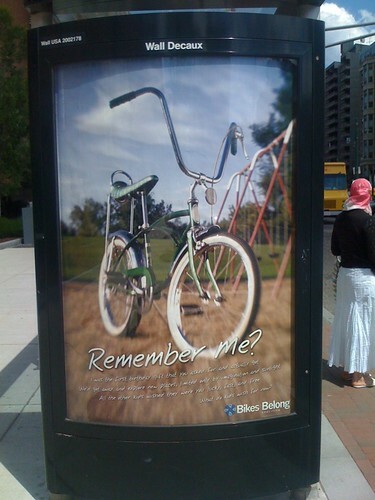 Don’t take it from the ad, take it from me, bicycling is wicked fun, is great exercise and is often quicker than driving (especially in the city) so if you haven’t ridden a bicycle recently, give it a shot! 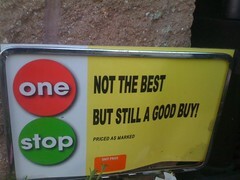 Anyone have some funny signs they’ve seen out in the wild? If so, send me an e-mail and I’ll feature it in a future post! Ummm. yeah I’m running into the same deal at flickr. Please post more about whether it’s worth it. And thanks for the compliment on my LAN song. You will be on my geek blogroll shortly. Will do colleen, I’m planning on writing a review within the next 10 days or so after I have a full week of experience with flickr Pro. So far so good, it simply expands on the free version (unlimited photos, unlimited sets, etc). which is excellent. I’ll let you know when the review is up. Thanks for the blogroll add! 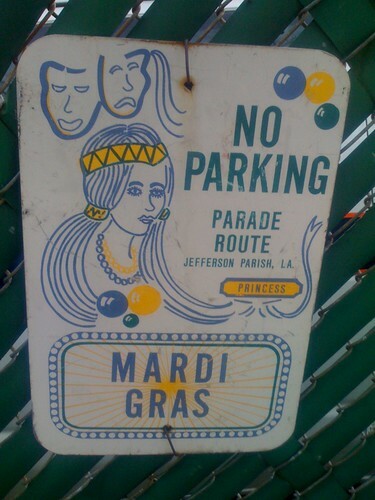 I love that Mardi Gras sign. What street is it on? Nice to see a fellow Wolfpack alum from Dot stop by here Emily! Love the Dot Rat tattoo you got! The sign is near the Stop & Shop in the South Bay Center. If you turn onto Allstate Road from Mass Ave, there’s a small, short, one-way street on the right side called Willow Court. Here’s a google maps link to the street. The sign is on the right side of Willow Court just past the first 2-3 houses on that street. Though now that I think about it I remember making an excursion to go photograph the sign before and found it missing only to reappear again, so hopefully the owners just take it down every now and then for cleaning or whatever. Also, sounds like we live in the same neighborhood (since I take that same route to the market), so thanks for stopping by here neighbor! Look you have great visions. I’m learn from your photos to take a perspective from an object. Thank you very much. Glad you enjoyed them kohvenk!